Name given to the first of Tishri, as being the New-Year's Day. In the Bible the Day of the Blowing of the Trumpet is the first day of the seventh—Sabbatical—month (Lev. xxiii. 24), and no mention is made of the Day of Judgment. The "day of God," in the sense of a time of divine judgment of the wicked, is the one that will appear at the end of days (see Day of the Lord; Eschatology); and a description of the divine judgment in heaven is found in Dan. vii. 9, 10, 22, where the "Ancient of days" is depicted as sitting upon the throne while the books are opened before Him. This description is also found in the apocryphal books. Of a specific day in the year on which God holds judgment over the world, no trace is found in pre-Talmudic literature. Philo, in his treatise on the festivals, calls New-Year's Day the festival of the sacred moon and feast of the trumpets, and explains the blowing of the trumpets as being a memorial of the giving of the Law and a reminder of God's benefits to mankind in general ("De Septennario," § 22). The Mishnah R. H. i. 2 contains the first known reference to the Day of Judgment. It says: "Four times in the year the world is judged: On Passover a decree is passed on the produce of the soil; on the Pentecost, on the fruits of the trees; on New-Year's Day all men pass before Him [the Lord] [an expression rendered by the Amoraim "like young lambs" (see "'Aruk," s.v. and )]; and on the Feast of Tabernacles a decree is passed on the rain of the year." "On the [second] Passover day the barley-offering is an invocation to God for the blessing of the soil's produce; the firstlings brought on Pentecost are an Invocation for the blessing of the fruits of the trees; and the libation of water on the Feast of Tabernacles is an invocation for blessing through rain. 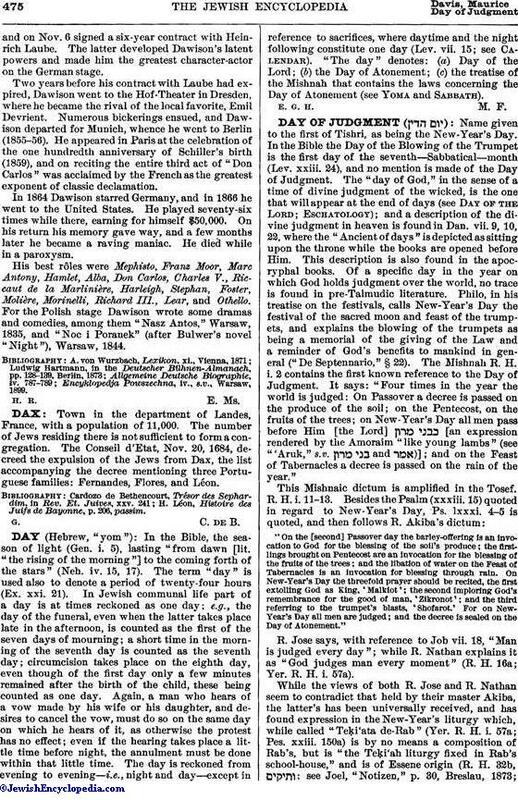 On New-Year's Day the threefold prayer should be recited, the first extolling God as King, 'Malkiot'; the second imploring God's remembrance for the good of man, 'Zikronot'; and the third referring to the trumpet's blasts, 'Shofarot.' For on New-Year's Day all men are judged; and the decree is sealed on the Day of Atonement." R. Jose says, with reference to Job vii. 18, "Man is judged every day"; while R. Nathan explains it as "God judges man every moment" (R. H. 16a; Yer. R. H. i. 57a). While the views of both R. Jose and R. Nathan seem to contradict that held by their master Akiba, the latter's has been universally received, and has found expression in the New-Year's liturgy which, while called "Teḳi'ata de-Rab" (Yer. R. H. i. 57a; Pes. xxiii. 150a) is by no means a composition of Rab's, but is "the Teḳi'ah liturgy fixed in Rab's school-house," and is of Essene origin (R. H. 32b, : see Joel, "Notizen," p. 30, Breslau, 1873;Liturgy; Essenes). 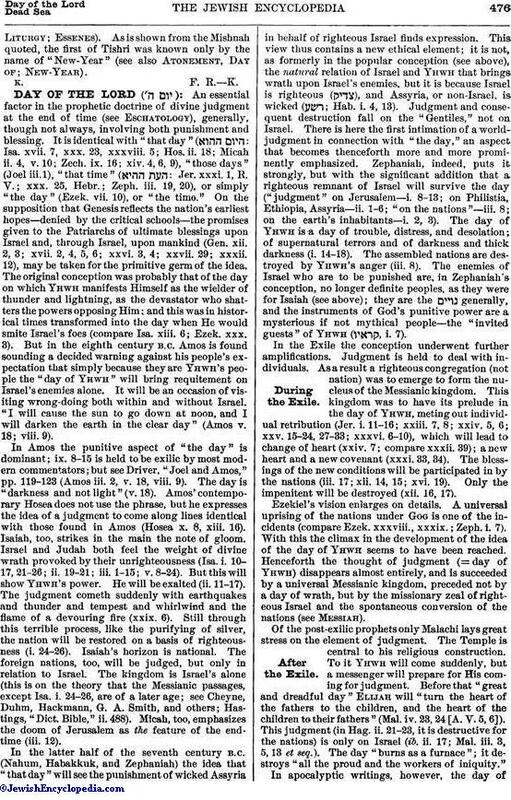 As is shown from the Mishnah quoted, the first of Tishri was known only by the name of "New-Year" (see also Atonement, Day of; New-Year).